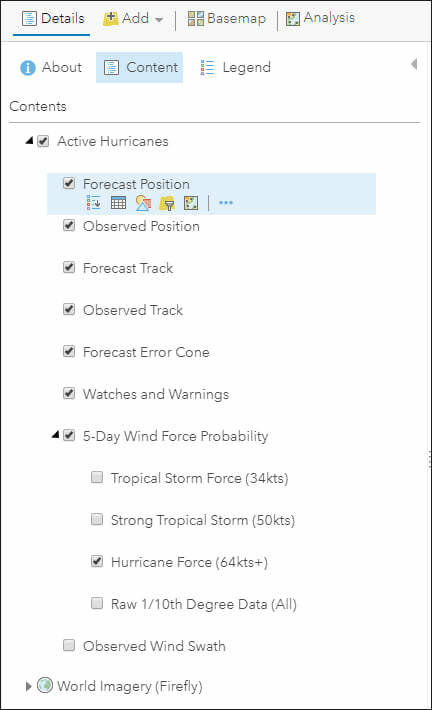 Active Hurricanes: Now Even Windier! It’s rare for hurricanes to threaten the Hawaiian Islands. And it’s even more rare for one to threaten Honolulu, which is nestled in the middle of the chain on Oahu. Hurricane Lane, however, is tracking along the coast and is generating hurricane conditions for many of the islands. Forecast #31a for Hurricane Lane on August 22, 2018. Note: this is a static dataset used for display purposes and is not the Live Feed. The forecast will change but this map will not. Turns out that the Active Hurricanes layer in the Living Atlas of the World was missing a wind field found in other products from the National Hurricane Center. Well…it has to do with how different components of the National Hurricane Center are responsible for different portions of the Atlantic and Pacific Basins, and they have different websites, data servers, and notification mechanisms. And when there are no storms (typically) to check if the data is there, you don’t know its missing. Kind of like the age-old question, “If a tree falls in a forest and no one is around to hear it, does it make a sound?” Only here, the tree is a major hurricane near the Hawaiian Islands. The good news is that Central Pacific storms now have the forecast wind probability fields. This layer shows the chance that winds of a certain speed will impact an area. The 64 knot layer is probably the most useful, as that shows hurricane force winds. The layer does not display by default, so you’ll need to expand the options and check the appropriate boxes. For comments or questions about this blog, please visit our GeoNet.